Hey guys sorry for the back and forth on this but I think the coupler I ordered will work great. Are you using a Cobalt SS MAP sensor with your Speed Density tune? If so, did you swap it in place of your stock one which I believe is tucked on the back of the intake manifold towards the firewall? Yes, I use the cobalt SS sensor. Here is part number and pic showing the tabs. I just used a little sandpaper wheel on a dremel to file it down. It feels a little 'loose' in there (stock one probably was too). But for our relatively low boost levels I bet it's OK. I might do a boost leak test one day. Yes, I use the cobalt SS sensor. Here is part number and pic showing the tabs. I just used a little sandpaper wheel on a dremel to file it down. It feels a little 'loose' in there (stock one probably was too). But for our relatively low boost levels I bet it's OK. I might do a boost leak test one day. 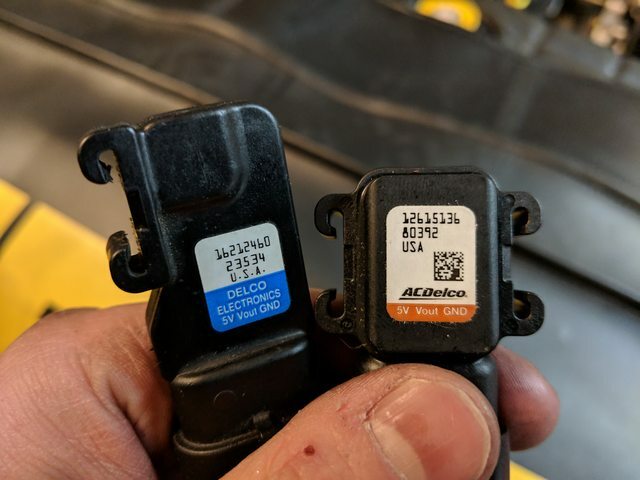 Also, which one is the cobalt sensor - right or left? 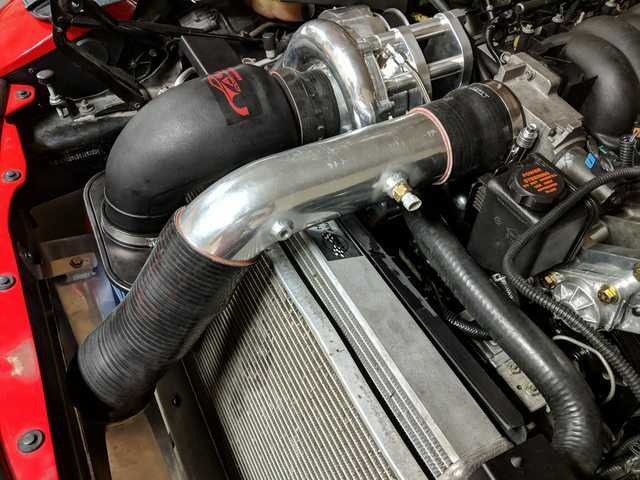 From the limited research I have done, sounds kind of tricky to get even a smaller hand back there to remove the old one and install the new one without removing the intake mainfold. Do you concur? Last edited by Toys4Life C5; 01-18-2019 at 10:20 AM. I did it, it was a pain to remove... I recommend keeping the wiring attached to the sensor when you remove it, I did not and when it broke loose, it was 'lost' in no-man's land for awhile but I was finally able to fish it out. Putting it back in, I put a little lube on the tip so to speak, and it will take a little fiddling around, but it wasn't too bad. Worst thing for me was not being able to confirm 100% that it was fully seated because you can't actually see it. I will definitely double check the next time the intake comes off..but I'm in no rush. I broke the plastic piece on the bottom of the intercooler. what material is that .ade out of? Or where can I buy that plastic piece? looks to be some type of abs plastic. Can't you just order a new one from a&a? It works as normal as long as you change a couple settings in the tune to account for the new sensor. If you swap without changing the tune, it won't work right because it will be reporting false manifold pressure information. ok, figures....any idea on what the tune settings are? If you have ti change the OS setting which one is it? 2 bar? The tables have what they call a "scaler" and "offset" value for calibrating the MAP. Stock is ~ 95/10. 2 bar settings are 200/8, but I've also seen 195/10 used...both will work fine. You can run SD on stock OS technically, by failing the MAF, but it will default to low octane table and might be a few other small limitations. The custom OS avoids those issues and opens up VE/timing tables in the 100+ kPa range. Last edited by aaronc7; 01-19-2019 at 11:51 AM. Just don't get into any boost with the stock OS and 1 bar in S-D mode. That would be bad. yes, I dont plan on getting into any boost until it hits the dyno and gets tuned...i may just buy a map sensor and bring it to the tuners.. I looked a while ago I didnt see it. Just call, josh or andy will hook you up. I have a laser cutter at work.